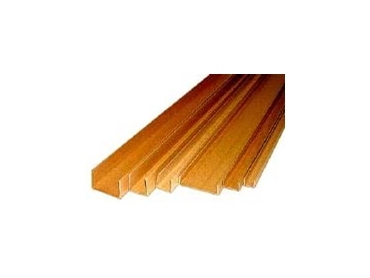 U-profiles -- robust and economical. PROTECTIVE edging that can take more than a knock, the perfect 'shock absorber' for products, and fully recyclable, is available from Pallet-Lok . Eltete’s U-profile reinforces products with a protective profile that is both robust and economical. Damage to corners and sides during transport and storage causes extra expenses and problems. By using protective U-profiles products are far more likely to reach the customer undamaged. U-profiles are compressed using specially selected, plain kraftliner with water-soluble glue. These constituents make the U-profiles 100% recyclable. The U-profile protects the product while holding it together. Punched-out corners make the use of protective frames easy while profiles that are adapted to the product protect edges and projecting parts during transport. They provide sturdy protection against knocks and can also be used, for example, on door openings, stairs or fragile equipment to afford protection during renovation or repair work.